Sullivan's Treadbrite Aluminum Deep Showcase Showbox [ASSD] : Highland Livestock Supply, Ltd, Products for all of your show animals! 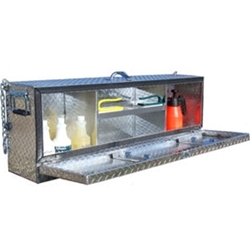 Made of durable diamond treadbrite aluminum to create a lightweight box with a scratch resistant surface. Designed with all the same great features as the Deep Galvanized Steel Showcase Box featured above (16-1/4" x 11-3/4" x 46"). Products shown are for display only - not included. A $15.00 packaging charge will apply. Per UPS regulations Showcase Show Boxes must ship as oversize packages. Additional UPS charges will apply.